Have you ever noticed how green everything looks after it rains? Well, it wasn’t your imagination. 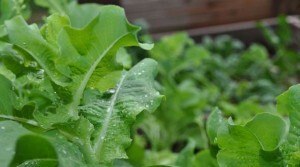 Rain that falls from the sky and waters your garden provides more than just moisture. Turns out that rain allows plants to take in the Oxygen and Nitrogen that naturally occurs in the air. When lightning strikes, it gives the Oxygen and Nitrogen molecules enough energy to form nitrates which the plants can take up. The atmosphere is about 21% Oxygen and 78% Nitrogen. That’s a lot of Nitrogen waiting to green up your plants. Another thing I didn’t realize until I started researching this post is that dust is another thing in rain that helps plants. Have you ever noticed how rain settles the dust? The dust in the air is filled with all kinds of organic goodness that goes straight to your plants when the dust filled rain falls in your garden. There are also things added to city water that are great for you, but not so much for your plants. Additionally, rain water has a neutral pH, which helps. I’ve mentioned before that “in my gardening dreams I plant a seed or transplant a plant, lovingly water it while relaxing nearby afterwards with a glass of iced tea. The plants grow visibly every single day. They create flawless fruit quickly“. Another way reality doesn’t match with my fantasy is the existence of weeds. Unfortunately weed seeds are everywhere. They blow around in the wind. They are in come mulches. In fact, I have had to pull up many many cantaloupe sprouts this spring because I made the mistake of putting cantaloupe seeds along with the rind into the worm bin. Sadly, the seeds survived and have been sprouting all over the place. Weeds (I’m including any unwanted plant in the category of weeds) take space, nutrition and water away from the things you’re actually trying to grow. Not only that, but they’re kind of unsightly as well. In short, the weeds? They have to go. Weeding can seem to be an overwhelming task. Weeds want to take over the world. I do have a couple of tips to cope with the whole weed issue. 1) Used raised beds. As I wrote in a previous post, my bed in the school garden was only a chain link fence away from a soccer field that is constantly seeded and green with grass all year long. Until we installed the raised bed, it really was just hopeless. There was no way to consistently keep the grass out of that bed. It made gardening there such a chore. Now, I get a couple of shoots of grass, but I’m able to easily keep up with it. When I added the new soil into the raised bed I put a think layer of newspaper on top of the old soil. The newspaper will compost, but in the meantime, the grass and everything down there will die. There are certainly things you can do to to help prevent weeds in the first place. We’ll leave that for another blog post. 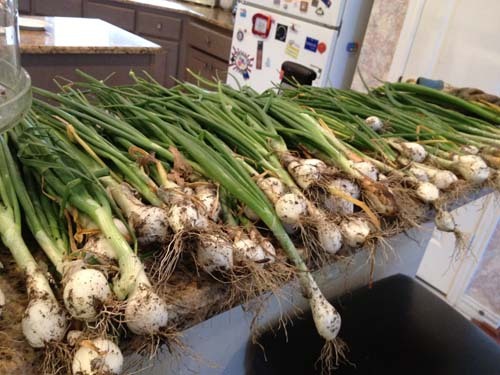 These are the onions I thinned from my garden. I just got back from the school garden. 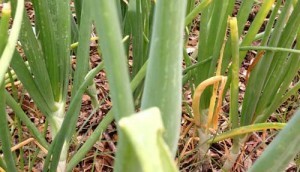 My primary reason for walking over was to spend 20 minutes pulling weeds from between my onion plants. As I was finishing up it occurred to me that those onions were never going to grow to full size planted like they are. It’s a long story, but I didn’t plant them. They were planted in groups of 3 and 4. Looking back on it, I would have planted them each separately. Because they were planted several in each hole, each onion bulb didn’t have room to become a big beautiful onion. As much as it killed me, I had to pull some out prematurely so that the others would have room to grow larger. When we plant seeds, we are instructed to put a couple of seeds in each whole. I think the reason for this is that not all seeds sprout. When more than one does, you have to thin. As a new gardener thrilled with things sprouting in your garden, the thought of thinning goes against everything you want to do. You’ve planted seeds, then you look at them daily, sometimes hourly waiting for them to sprout. Pulling out those precious sprouts just seems wrong. If you don’t thin your plants, they simply won’t have the room and the soil resources to grow the way they’re supposed to. I’m all for making the best use of the garden space you have, but don’t compromise your plants by overcrowding. Also, depending on what you’re thinning, you can actually go ahead and use what you’ve thinned. The picture above are the onions I thinned. I’ll certainly be using them! Baby potatoes, baby spinach, baby carrots…you can use them all. 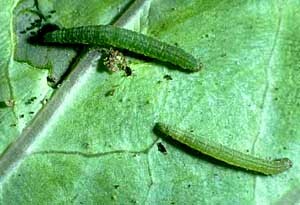 Here is an actual picture of the worms I smash. The worms eating my plants. Last night on my worm inspection they were bigger and fatter than usual. I actually had to take a deep breath before I grabbed this guy and smashed him with my bare hands. What is eating this plant? Now is the time of year when seeds are sprouting. Eager looking plants are lined up at the garden center, ready for a long and fruitful life in my garden. In my gardening dreams I plant a seed or transplant a plant, lovingly water it while relaxing nearby afterwards with a glass of iced tea. The reality is quite different. The fact is there is an army of various creatures who would love nothing more than to feast on my garden before I ever have a chance. Everything I have planted in one of my beds in my yard is getting munched by something. This is a picture of a bell pepper plant after I covered it in Diatomaceous Earth. 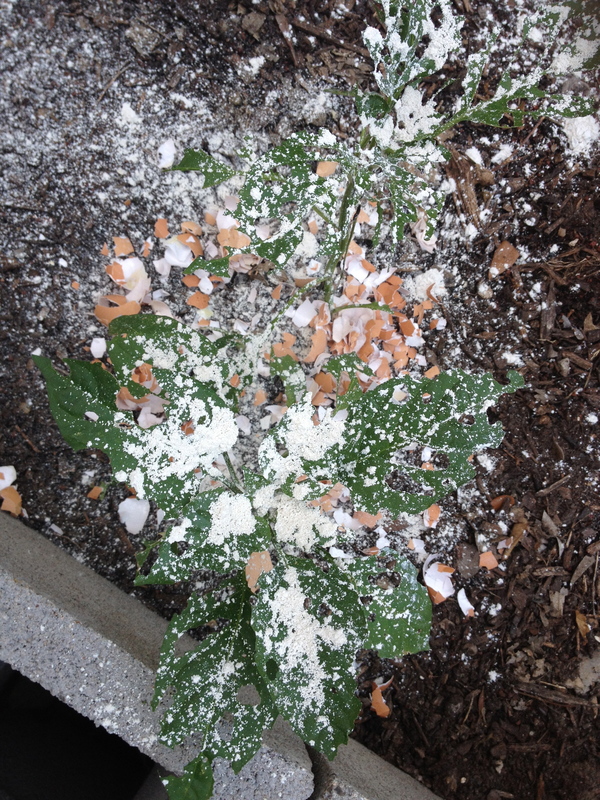 You might also notice the crushed egg shells around the base of the plant. I read that slugs can’t get over egg shells because they’re too sharp. This was when I was going under the assumption that it was slugs. I eliminated that theory when I actually spotted one of the culprits. They look like this picture below. 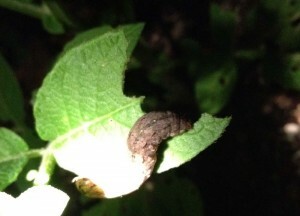 Turns out the abundance of moths I have witnessed over the last month were busy making babies all over my plants. Well, it’s time for those moth babies to die. If I don’t stop them, they will completely kill my plants. They are currently attempting to consume my basil, a kale plant, some baby broccoli plants and two green to red pepper plants. My current plan is to spray with BT (often). Also, I go out at least twice a day (morning and night) and kill those green slimy things with my bare hands. They will stop eating my plants. I love to garden. When I don't have to go to my day job, my garden is where you will find me. It's where my imagination is most of the time and it's where I would always prefer to be.